I'm going to try to be okay with failure. Just writing that resolution down makes me pause a bit. See, this year's resolution is unlike any of years past. Every year, my resolutions have been consistently similar and always along the lines of work harder, achieve this, accomplish that. To resolve to embrace failure seems completely unnatural when you're the immigrant child of immigrant parents and the desire and expectation to succeed is hardwired in your very being. See, we ended 2013 with what I thought was a giant failure. On Christmas day, we embarked on a 3-day intensive plan to potty train Little Man. We were ridiculously ready and might I add, a bit gung-ho. We'd read all the manuals, lined the floor of the playroom, and decorated an enormous jar for reward M&Ms. Oh, and we had a giant supply of the world's cutest Mickey Mouse underwear. A few days beforehand, the Hubster and I would say delusional things to each other like, "Little Man is super smart, I'm sure he'll totally get it." In short, we were ready to show potty training who was boss. On Day 5 of the 3-day intensive plan, after countless tantrums, clean ups, and bribes, things began to break down. All three of us were tired, annoyed, and in serious need of our third baths of the day when the Hubster convinced me that we had to stop the insanity. Little Man wasn't ready. Whether it was because he understood and didn't want to or because he just didn't understand yet, he clearly wasn't ready. And we were driving each other bonkers by going through the same cycle over and over hoping for a different outcome. So we gave Little Man a bath, and put him back in diapers and favorite footie pajamas with the red fire trucks, and rocked him to sleep. Then the Hubster and I sat in silence with our legs on the coffee table and powered through a container of Ben & Jerry's Chocolate Fudge Brownie. And because that only sort of helped, we worked our way through a container of Peanut Butter Cup. And only then was I ready to talk. I was bummed we'd spent five precious days of vacation with no measurable result. I kept hoping Day 6 or Day 7 would get us there. I had no idea when we'd have the time to try this again. How would we handle two babies in diapers? What could we have done differently? There were no answers. Only an overwhelming sense of failure (and a whole lot of dirty laundry). So we sat there some more. We may or may not have eaten a third container of ice cream. The next morning, Little Man woke up at 6 a.m. like he always does except we were able to bring him to our bed like we used to because we were no longer afraid of accidents. We showered relaxedly without one of us guarding Little Man. We made French Toast and ate it on our fabric-lined dining chairs, with the sun pouring through the windows. And we laughed, the Hubster and Little Man easily, me still a bit grudgingly. Once we finally abandoned the potty training, we had a lovely vacation where we tried to cram in 8 days of adventures into the remaining 3. We went out for pizza, played at the children's museum, zoomed down the big slide at the park, ate far too many hamburgers, and on a day when Little Man went to visit his grandparents, the Hubster and I saw our first movie in a theater in years. But every now and then, throughout the fun and ridiculously sunny December days, I would think of how we'd failed. I remained convinced we'd given it our all. Gosh, we had so given it our all but truth be told, that failure still stung. There was no denying that we were so much happier and those 3 days of diapers were eons better than the 5 diaper-less days before. I kept reminding myself of that when I thought about how we'd failed. So I made soup because there's something therapeutic about soup. 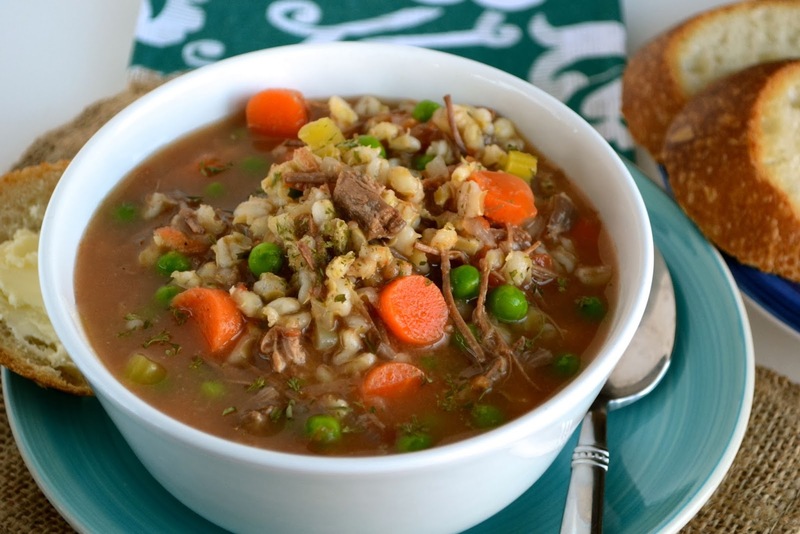 Take this Beef & Barley soup, perfectly hearty with creamy barley and all those vegetables that you need at the start of a new year. Brown the beef, watching the edges of each piece take on the right amount of golden color and just the right bit of char. Toss in the rest of the ingredients, pour on the broth, and wait until it all comes together, almost magically. In short, soup's a great way to come to terms with failure. And more importantly, to resolve to try again in a few months. In a large dutch oven, add oil and brown beef cubes. Pour off half of the fat. In the remaining fat, add garlic and cook for approximately one minute until garlic is golden. Add the remaining vegetables, tomato sauce, and tomato paste, and cook for 2-3 minutes. Add the beef broth, pearled barley, bay leaves, and thyme. Bring mixture to a boil, then lower heat, cover, and cook for 1-2 hours. In the last twenty minutes of cooking, I like to uncover and cook on high heat so the broth thickens up and takes on more of a delicious beef stew feel but you should feel free to skip this step if you like your soup more soupy. Season with salt and pepper. I wouldn't call it a failure as I would simply file it under "Not Today." While I can't speak to potty-training (except that my brother and SIL use the Tic-Tac reward method), I very much empathize with the frustration, having dealt with some of that for the last quarter of 2013. I ended up having to readjust and figure something else out that would work better, and (fingers crossed) I'm emerging on the other side of that valley. I have two sons and if there is anything I have learned about potty training is that they will do it, only when they are ready, and not a moment sooner. Put the stress away, forget about it for now. I promise that he will not start college without being potty trained (laugh). There is no failure here. You tried and he was not ready. Soup is so very comforting. My husband and I don't have kids yet so I can't imagine what potty training is like! But soup definitely makes me feel better after having a rough time of it. I love using barley, but don't nearly enough. This looks delicious! My best friend's son is just 11 days younger than Maya and yet he took a lot longer to get the hang of potty training...I think boys are just a bit slower in this arena than girls. Don't get discouraged! Little Man will get there soon, I'm sure. And Ben & Jerry's used to get me through so many things...their Chocolate Brownie is The Best! It's not a failure, just a small setback. Little Man will be ready when he wants to show his little sister just what a good role model he is I bet. I love beef and barley soup, my mom made it for us all the time growing up and since I've already failed at my resolution of going on a juice fast, I may as well have a bowl of hearty soup. It's all about re-framing my friend. Can't believe all the holidays are finally over, sigh. The expectations we put on our children can be set so ridicuously high that we end up letting ourselves down in the end. Don't worry, your son will evenutally get there when it comes to potty training. It's no reflection on you as a parent. And I have no doubt your Beef and Barley soup helped ease the frustration of it all. Looks delicious! So glad you chose to enjoy the rest and took a break. Your little one is gonna surprise you soon, he will one day conquer it and without any effort on your part. I agree with Ameena, boys do take time and each kid is so different. Icecream and your soups sounds awesome my dear. Hope you are doing good and A VERY VERY HAPPY NEW YEAR!! You know, when he is ready, it will be easy! And yall tried - yall laughed - and yall ate (even if it might have been 3 tubs of ice cream ) ;) and that surely doesn't sound like a failure! Now to this soup - it sure looks thick and hearty and all sorts of yummy! This soup is so perfect for the cold winter days! It looks so thick and delicious. I have to start cooking dinner soon will deff give this a try! 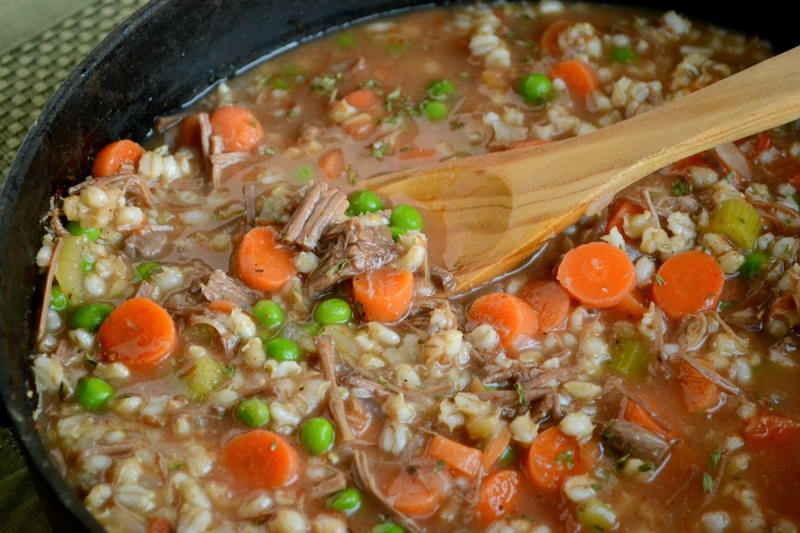 This beef and barley soup looks awesome! Failure is not the right word in this context. It sounds too final and potty training is not Final by any means. Even after he is potty trained, there will be days of accidents, days of wanting to go back to the diaper etc etc. Hang in there, you haven't failed- you're just not there yet. Someday soon it will just happen and you will think about why you were so hard on yourself. Hugs. I totally feel for you and I can relate. It wasn't long ago that we had to potty train our little guy (he's 8 now) and it was 'the worst'! Especially with boys, I think. You start them sitting down and then you need to get them to stand and then they regress....I feel your pain but you just need to remember he will be trained eventually and there is really no rush, no matter what anyone says. Soup looks absolutely great, btw! I think parenthood teaches you more about failure than anything else. I know that I have felt like a "failure" more times during these past 7 months than I have in a very long time. But I think your perspective is right on: we need to embrace this season. We need to accept that we can't always make it happen on our timelines. Thank you for sharing both your wisdom and this beautiful soup! I love how you made this post SO personal. First visit to your blog, and I definitely coming back. I don't have a child, but I can imagine you only wanted the best for him to be potty trained...I can imagine it is not an easy task. I'm sure when he is ready he will do fabulous. This soup looks awesome...never made it before but I do love a good beef and barley soup...perfect to get through the rest of this fun winter, eh? Thanks for sharing!